Citizens Against Government Waste awarded Democratic California Gov. 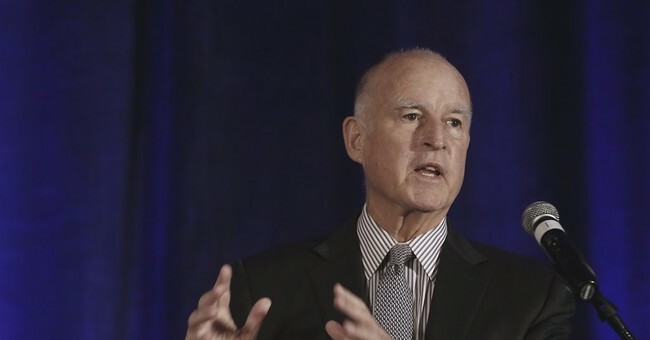 Jerry Brown their coveted Porker of the Month award for a multi-billion dollar project to save three-inch fish, which are pretty much pass the point of extinction due to the state’s prolonged drought. In all, it’s a $15 billion disaster, and some estimates have it soaring near $70 billion because these are Democrats. And Democrats are horrible with managing people’s money. The debate over Gov. Brown’s $15 billion “WaterFix” Twin Tunnels project is intensifying ahead of the start of hearings before the California State Water Resources Control Board on April 7. The proposal would build two tunnels 150 feet underground to divert water from the northern side of the Sacramento-San Joaquin River Delta. The plan would continue to divert fresh water away from farms and communities statewide who have suffered through a nearly five-year-old drought. The supposed purpose of the project, as well as the reasoning for the continued diversion, is to address a longstanding issue in California: a three-inch fish known as the delta smelt. Worse yet, a 2015 state study determined that the smelt may have already passed the point of extinction due to the drought. Only six fish were found in the waters last year.